READ: In National News, From the E-Mailbag: Instead Of People Raising Money Using His Name, Today Dr. Ben Carson Raises Money For... Who?!? Professional conservative money raiser-spenders have been using Dr. Ben Carson as a fundraising figure for their own purposes. The National Draft Ben Carson For President Committee has raised $7.3M online and through direct mail. Instead, Carson is working within the well-established party structure, raising money for the National Republican Senatorial Committee ("NRSC"), as the GOP attempts to take back control of the Senate. He focuses on "Replacing Obamacare". Replacing Obamacare starts with taking back the Senate from Harry Reid and the Democrats. We, as a country, need to have a real conversation about how to reform our healthcare system in a way that improves quality, reduces costs, expands access, and honors America’s legacy. Instead of having that conversation, Democrats have been raising millions of dollars to spread their false attacks on conservatives...We need your help to set the record straight. Control of the U.S. Senate hangs in the balance this year, but the Democrats are currently outspending Republicans in the most competitive states. Election Day is getting closer and closer. We need supporters like you to win back the Senate and reform our healthcare system. Please donate $20.14 TODAY to help take back Senate. *The Draft committee did just spend approximately $500,000 on radio ads for two Senate races in North Carolina and Louisiana. However, the ads mention Carson and the Draft committee more than the Republican candidates, and, they appear to be little more than further fundraising efforts for organizer John Phillip Sousa IV and others involved. Illegal activity on our southern border has reached epidemic proportions. Transportation of drugs, guns and human beings by criminal cartels and human smugglers has increased border lawlessness resulting in human tragedies. Arizona has become “ground zero” for crimes committed daily as a result of the Federal Government’s failed policies and lackluster enforcement of current laws by local and state officials. Empty rhetoric and ideological tirades of the past four years have divided our community and prevented effective enforcement. Whether that be protecting our voter ID laws or ensuring programs like E-Verify are adhered to, we need to make sure our immigration laws are respected and enforced. I am against amnesty and support law and order. The Attorney General’s office must focus on the criminals who invade our border and profit from their illegal activity. As these criminals and their smuggled goods and human cargo migrate from the border to their distribution centers, a trail of crime, destroyed property and human misery follow. Kidnappings and extortion are commonplace. These criminals are violent, sophisticated and organized. The protection of Arizona’s homeland and its citizens needs the involvement of every level of law enforcement. The Federal Government has failed in its responsibility to secure our borders. This has created a void in enforcement that the Attorney General will fill. I propose a two pronged attack of simultaneously and vigorously prosecuting and demanding harsh prison sentences for cartels and human smugglers, while at the same time destroying the ability of the criminals to financially profit by utilizing Arizona’s RICO statutes to seize their assets. Securing the Border will increase opportunities for trade with Mexico, spur economic development and lead to increased revenue for Arizona businesses. As Attorney General, I will use the Office to call out the federal government for its failure to fix the broken immigration system. I will also continue to pressure Arizona’s U. S. Senators and Congressional Delegation to pass immigration reform. With effective and smart reforms, law enforcement can more effectively fight violent criminals and focus its limited resources on keeping Arizonans safe. I will do everything I can as Attorney General to work with border community law enforcement agencies to keep our communities safe. Within my first 60 days in office, I’ll convene a statewide summit of county prosecutors, sheriffs, police chiefs and other lawmen and women. These law enforcement professionals are truly Arizona’s “boots on the ground” when it comes to protecting the public. And while the law enforcement priorities in Cochise County aren’t necessarily the same as those in Apache County, all of us in Arizona are dealing with common concerns such as human smuggling and the drug trade. As Attorney General, I’m committed to working together with these law enforcement professionals – Republican or Democrat – to keep Arizona citizens safe. The answer is below the jump! The Republican Attorneys General Association ("RAGA") begins airing its new $1M+ ad campaign against Felecia Rotellini today. The attack starts off by claiming that the Democratic nominee "doesn't support securing the border", after noting that "drug dealers, terrorists, violent criminals" are "crossing our border, threatening Arizonans." The ad also claims that Rotellini "doesn't get" the danger because "she's never prosecuted a violent criminal", whereas GOP nominee Mark Brnovich gets it. RAGA Arizona is going on the air more than two weeks before their Democratic counterparts are currently scheduled to. Initial FCC filings showed that the start date would be October 6, but subsequent filings revealed the buy to be starting up today, and closer to the $1.6M budget ($300,000+/week for five weeks) previously discussed. Arizona's Politics is not familiar with any credible reports of terrorists crossing the U.S.-Mexico border and/or threatening Arizona citizens. Mark Brnovich, the GOP candidate for Arizona Attorney General, just released his wordless campaign ad, tousling his daughter's hair and smiling with constituents with the best of 'em. The specialized videos became known as "McConnelling" earlier this year, after Senate Minority Leader Mitch McConnell released one with somewhat-unnatural-looking camera interactions. Brnovich appears more at ease in these staged scenes. Now that the footage is in the public arena, it can be legitimately picked up by Super PACs and independent expenditure committees that wish to advertise on Brnovich's behalf. Arizona's Politics has already detailed the planned advertising campaign by the Republican Attorneys General Association and their relatively-dark Arizona effort. "Get Ahead With Fred" is a new "Independent Expenditure" committee supporting Democratic gubernatorial candidate Fred DuVal. This afternoon, it notified the Secretary of State that it had spent more than $27,000 last week putting up signs for DuVal. All of that would be fine. Except the obviously-single-minded IE committee is chaired by Tim Riester, the "Principal and CEO" of Riester Corp. Riester donated $912 to DuVal's official campaign committee in February 2013, and that would also be fine. Except that Riester Corp. then promptly began consulting for "Fred for Arizona". Riester Corp. worked extensively - to the tune of $35,118.57 (some or much paid to third parties for advertising, etc.) through January 2014. The Arizona GOP Party has already filed a complaint with Secretary of State Ken Bennett, alleging that illegal coordination must have occurred between the candidate's campaign and such a close adviser through the formative stages of the campaign. The National Republican Congressional Committee ("NRCC") continues to make its ads against incumbent Rep. Ann Kirkpatrick (D-CD1) a series, this time focusing on the Congresswoman's boots. The NRCC first made the much-mocked spot showing the rural Kirkpatrick as a skirt-and-high-heeled figure traipsing back-and-forth. When Kirkpatrick responded by highlighting her cowboy boots, the NRCC has adapted. This time, the NRCC takes the footage of Kirkpatrick's stomp, and uses it to suggest that she is stomping on taxpayers with her votes. Also, this ad is the first time that the NRCC actually shows Kirkpatrick. The ad highlights a vote on a 2013 Republican measure that was designed to thwart feared carbon tax-like rules from the EPA or the Department of Energy. 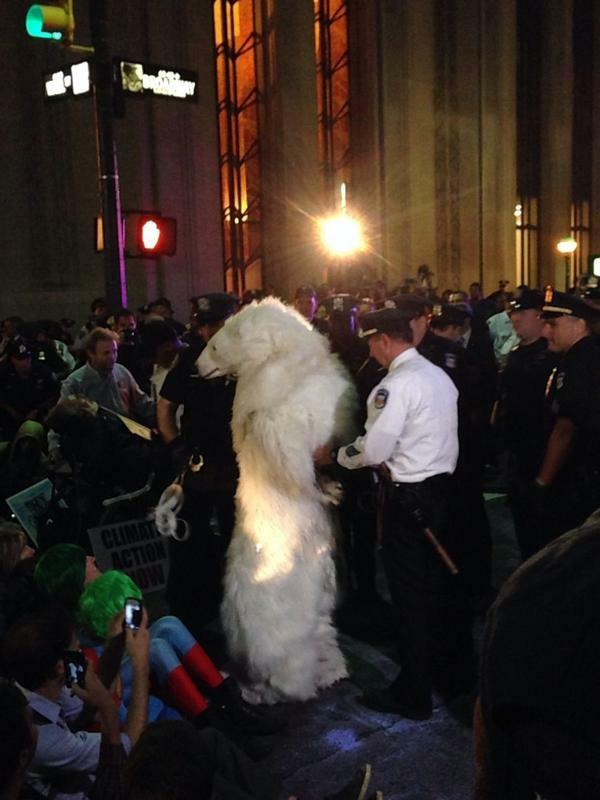 The law did not pass, and the Administration has not proposed any such rules. It also scolds her for debt limit increase votes and Obamacare votes. The NRCC spent $20,860 producing the ad, and is spending $264,011.23 airing it during the next week. To date, the NRCC has spent nearly $1.5M in the "pure toss-up" campaign. Today's not the first time that I have gone over to my Facebook page to see the concerned folks at Facebook asking me to reassure Sean Noble of my identity by posting a new profile picture. (What happened to my prickly Arizona cactus?) The irony of Facebook choosing Sean from my 200+ FB friends for this message is too good to go unnoticed. Thanks for the smile, Facebook. Don't worry, Sean. It's me. New House Majority Leader Kevin McCarthy is hoping to raise a lot of money for the GOP's three Arizona challengers in swing districts when he drops by Phoenix's Seasons 52 restaurant for lund tomorrow (Sept. 24). State House Speaker Andy Tobin, Martha McSally and Wendy Rogers have formed the "Arizona Congressional Victory Fund" joint fundraising committee with the National Republican Congressional Committee ("NRCC"), which means that although the lunch ticket tomorrow is $500, the maximum contribution for an individual or political committee is $40,200. The full invitation is below. Tobin, McSally and Rogers are trying to unseat Democratic incumbent Reps. Ann Kirkpatrick (D-CD1), Ron Barber (D-CD2) and Kyrsten Sinema (D-CD9), respectively. The first two races are rated as pure toss-ups by national rating services, while CD9 is listed as leaning Democratic. Seasons 52 is owned by Darden Restaurants, a national restaurant group that also owns Olive Garden and Red Lobster restaurants. Sean Noble's American Encore has released a new $128,000 television ad touting Treasurer Doug Ducey's "Steady Leadership" on educational issues. The 2nd advertisement from the dark money independent expenditure committee supporting the GOP nominee for Governor touts Ducey's leadership roles on education ballot measures that were on the 2012 ballot: for Prop. 118 - which established a different formula for how much Arizona schools receive from state trust lands - and opposing Prop. 204 - the continuation of the state sales tax that was tied to education and other items. On the "50 Shades of Dark Money" scale introduced last week, the American Encore effort receives a 48 "nearly black" score. American Encore - formerly known as the Center to Protect Patient Rights - is the nationally-known organization run by Arizona political consultant (and nice guy/Disney enthusiast) Sean Noble. On Wednesday, the Republican-controlled U.S. House of Representatives overwhelmingly called for an audit of the Federal Reserve System's policy decisions regarding interest rates and monetary policy. Eight of Arizona's nine Representatives voted with the 333-92 majority; only Rep. Ann Kirkpatrick (D-CD1) did not. The Audit the Fed bill passed the House last week with its highest vote total ever*, and it still has little chance of seeing the light of day in the Senate. But, it put Democrats on record (one Republican - Campbell in CA - voted nay, 106 Dems voted aye). The Federal Reserve System ("the Fed") is audited, but only its central financial operations. This bill would remove the exemptions that have been written into law to maintain separation between the Fed and the federal government. "I strongly support increased transparency at the Federal Reserve. Since the financial crisis, Congress has already required increased transparency that balances proper oversight with protecting the Fed from a politicized process. I am concerned that the bill voted on by the House could subject monetary policy decisions made by the Fed to political pressure. As an independent government agency, the Federal Reserve should base decisions solely on economic considerations to maintain sound monetary policy. As required by Congress, the GAO already regularly audits the Fed. However, this bill expands the GAO’s audit authority to the deliberations of the Federal Open Market Committee (FOMC) related to interest rate and monetary policy, beyond a traditional audit. I am concerned that an unintended consequence of this expansion could compromise the Fed’s independence and jeopardize our fragile economic growth." The proposed bill would amend the U.S. Code section posted below. It would eliminate all of the "may not includes" in subsection (b) and - under the term "technical and conforming amendments" - get rid of subsection (f), which not only contains other limitations but also provides for "delayed disclosure" of specific transactions. * When the identical bill was voted on in the House in 2012, Arizona's entire delegation voted aye; Kirkpatrick was not in the House in 2012. BEER FACT CHECK: KTAR's FAILED Claim That Beer Prices At Arizona Cardinals' Games Are "Pretty Decent Deal" & "Cheaper Than League Average"
Arizona's Politics was pretty happy to see the KTAR Tweet yesterday proclaiming that beer prices at Arizona Cardinals' games are cheaper than the league average; while we won't be at today's game against the Niners, we try to make it to at least one home game/year, and the games always go better with a cold one. The article - written by the "KTAR Newsroom" - even goes one step further and declares in the lead that you are "getting a pretty decent deal". The Cardinals charge $7.25 for a 12 ounce beer. Unfortunately, the sole basis for that - other than the obvious desire that beer purchasers at many events want to reassure themselves that it is a "pretty decent deal" - is a survey that BusinessInsider.com reported on of the NFL stadium concessionaires. Teams self-reported the prices and sizes of the smallest beers - of whatever quality or lack thereof - on the menu board. BusinessInsider.com gave the appropriate context and did not try to inappropriately compare a 12 ounce beer at one stadium to the 21 ounce "small" beer at another (hello, Pittsburgh!). Perhaps because KTAR is the radio home of the Cardinals - or perhaps because the author (authors?) had already had a few small beers - the localized article contained no such wisdom. The only reason UOP Stadium's small beers are below the league average is because only 7 stadia offer a 12 ounce beer, and the Phoenix 12-oz. is the 2nd highest of those 7. Those bums in Philly charge $8.50 for a 12 ounce beer; no wonder the fans are angry. The other five cities charge $4.50 or $5. It only took Arizona's Politics a couple of minutes to calculate the league average PER OUNCE, for the smallest beer offered at each stadium. That average is $0.45/ounce. The Cardinals? $0.60/ounce. In other words, the Cardinals are soaking us 33% more than the average NFL team is, for a small beer. And, the Cardinals' small beer is THE SECOND MOST COSTLY - PER OUNCE - IN THE NFL! I mentioned yesterday that the lesson is to buy the larger sizes. More likely, the correct lesson is to either TAILGATE or to NOT DRINK BEER. Regardless, KTAR was completely soused when they tried to localize the data, and that has us SEEING RED! An "F" for KTAR, and they owe us all a beer! An interesting week in Arizona in the major spending battle between the national Congressional arms of the Democratic and Republican parties. 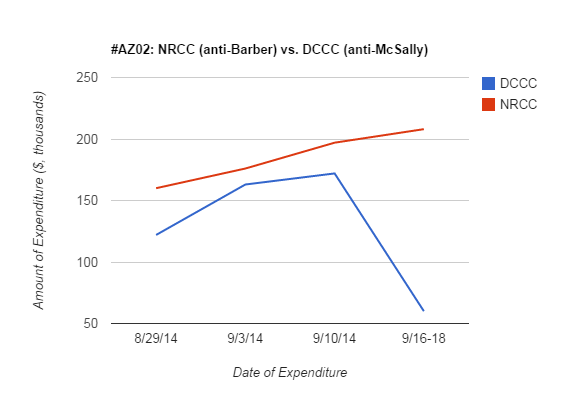 The GOP's NRCC continued to ramp up its spending in the toss-up battle between Martha McSally and Rep. Ron Barber (D-CD2) while the DCCC did not make a new ad buy (while still running new ads). In the other toss-up battle, both parties spent slightly less this week, and the DCCC has still spent more attacking challenger Andy Tobin in his bid to unseat Rep. Ann Kirkpatrick (D-CD1). The DCCC ("Democratic Congressional Campaign Committee") produced two new ads (below), at a total cost of $52,878. It also purchased $390,626.87 in airtime this week, bringing its total anti-Tobin total to $1,273,009. Attacking the incumbent, the NRCC ("National Republican Congressional Committee") bought $262,313.23 worth of spots to continue airing its 2nd baggage claim. 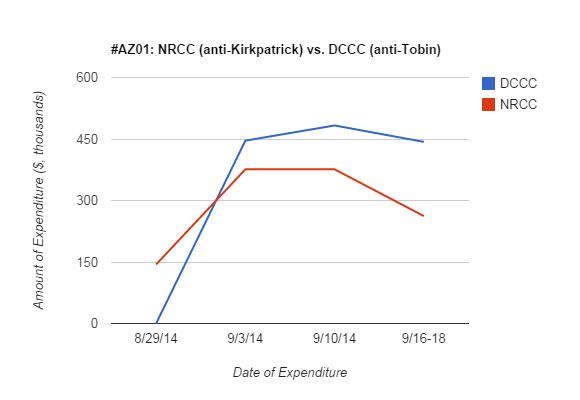 The NRCC's total anti-Kirkpatrick spend is now $1,202,643. The graph (right) shows that the NRCC started spending money on this race right after the primary, while the DCCC waited until it was certain who the GOP nominee would be. Since then, the DCCC has consistently spent more each week. In CD2, the NRCC produced a new anti-Barber ad ($21,250) (below) and purchased $186,778.45 of airtime. That brought its CD2 total to $784,339. The DCCC spent $6,108 on production and $54,586.98 on its ad buy for the week, bringing its total to $537,550. The graph (left) shows the strategies more clearly. The NRCC is steadily increasing its effort; the DCCC's fall-off this week could be one or more of several factors: a timing anomaly, a dramatic surplus of confidence (unlikely), a catastrophic drop in confidence (also unlikely), the entrance into the race of other players (Americans for Responsible Solutions, House Majority PAC). Or, none of the above. Maybe next week will help clarify. Remember the budgets announced earlier by the DCCC and the NRCC for these key races. An uncle of slain U.S. Border Patrol Agent Brian Terry - along with the Brian Terry Foundation - started a new Super PAC this week to influence Congressional elections. The new Brian Terry Secure Border Project PAC filed its federal paperwork out of Phoenix on Tuesday. Terry was killed in a shootout on the Arizona side of the U.S.-Mexico border in 2010, and drew attention to the gun-walking program-turned-scandal known as Fast and Furious. Terry's family formed the Brian Terry Foundation, and this new Super PAC effort involves many of the same people. Uncle Ralph Terry is listed in the paperwork as the Treasurer of the new Super PAC, which can accept unlimited contributions and can make independent expenditures in Congressional races. There does not appear to be a website up for the Super PAC at this time. Arizona's Politics has inquired about further information, and will supplement if more information becomes available. Arizona Delegation Splits Vote On Arming Syrian Rebels; Dems Split, Repubs Split; Text of Resolution; Reaction From AZ Reps. The final vote was 273-156. The Republicans split 159-71, and the Democrats split 114-85. The Arizona delegation was even more closely split. (2) the President shall submit to the appropriate congressional committees and leadership of the House of Representatives and Senate a report, in unclassified form with a classified annex as appropriate, that contains a description of how such assistance fits within a larger regional strategy. (6) an assessment of the effectiveness of the assistance authorized under subsection (a) as measured against subsections (b) and (c). (1) The term ``appropriately vetted'' means, with respect to elements of the Syrian opposition and other Syrian groups and individuals, at a minimum, assessments of such elements, groups, and individuals for associations with terrorist groups, Shia militias aligned with or supporting the Government of Syria, and groups associated with the Government of Iran. Such groups include, but are not limited to, the Islamic State of Iraq and the Levant (ISIL), Jabhat al Nusrah, Ahrar al Sham, other al-Qaeda related groups, and Hezbollah. (B) the Committee on Armed Services, the Committee on Foreign Relations, the Committee on Appropriations, and the Select Committee on Intelligence of the Senate. (f) The Department of Defense may submit a reprogramming or transfer request to the congressional defense committees for funds made available by section 101(a)(3) of this joint resolution and designated in section 114 of this joint resolution to carry out activities authorized under this section notwithstanding sections 102 and 104 of this joint resolution. (g) The Secretary of Defense may accept and retain contributions, including assistance in-kind, from foreign governments to carry out activities as authorized by this section which shall be credited to appropriations made available by this joint resolution for the appropriate operation and maintenance accounts, except that any funds so accepted by the Secretary shall not be available for obligation until a reprogramming action is submitted to the congressional defense committees: Provided, That amounts made available by this subsection are designated by the Congress for Overseas Contingency Operations/Global War on Terrorism pursuant to section 251(b)(2)(A) of the Balanced Budget and Emergency Deficit Control Act of 1985: Provided further, That such amounts shall be available only if the President so designates such amounts and transmits such designations to the Congress. (h) The authority provided in this section shall continue in effect through the earlier of the date specified in section 106(3) of this joint resolution or the date of the enactment of an Act authorizing appropriations for fiscal year 2015 for military activities of the Department of Defense. (i) Nothing in this section shall be construed to constitute a specific statutory authorization for the introduction of United States Armed Forces into hostilities or into situations wherein hostilities are clearly indicated by the circumstances. (j) Nothing in this section supersedes or alters the continuing obligations of the President to report to Congress pursuant to section 4 of the War Powers Resolution (50 U.S.C. 1543) regarding the use of United States Armed Forces abroad. “In addition to the fiscal irresponsibility of perpetually passing continuing resolutions to fund our government, I have grave concerns over the implications of passing an amendment that supports the President’s plan to fund, train, and arm Syrian rebel fighters. By coming to the Congress only with the most contentious aspect of his ISIS strategy, the President shows that he only cares for Congress’ input when he seeks to avoid potential political pitfalls by diffusing responsibility. “Furthermore, like many Americans, I’m concerned over the President’s ability to positively differentiate between our allies and our adversaries in the Syrian conflict. As we have seen in Iraq, arming a group of fighters is not wise if those individuals will either desert their posts or support the enemy they claim to oppose. The President’s assurances that he knows who should be receiving our aid are not enough. Congress has an obligation to ensure that our weapons are not used against U.S. forces or U.S. interests before we authorize their disbursement. Two weeks ago, the President called the Free Syrian Army a ‘fantasy;’ now he wants them to be the tip of the spear in America’s ISIS strategy. "Furthermore, the McKeon Amendment which approved of the President’s plan for dealing with the Islamic State of Iraq and Syria (ISIS) is a poor strategy. I voted against arming violent death squads that have no loyalty to the United States or our values. We have no allies in Syria. We should not be spending precious taxpayer money and jeopardizing the lives of our soldiers to help one terrorist group fight another terrorist group. Further, Congress has not declared war, as is required under the Constitution. We cannot fund a war that we have not officially declared. Several generals and foreign policy experts have stated that it will take American boots on the ground to finish the job and dismantle ISIS. The President continues to make clear this is not an option, even contradicting military advisors within his own administration. I have serious concerns about the President’s plan or lack thereof. As such, I could not support this panicked reaction to "do something" that is not thought out and lacks a winnable strategy." Where does all that money come from, and is it "dark money" or pure-as-Ivory-Soap-money? Obviously, it is NOT the latter! But, there are different definitions and degrees of "dark money", and we will attempt to clearly explain how we come to the conclusion that DAGA's money is a few shades lighter than RAGA's. However, Arizona's campaign finance laws are relaxed when it comes to identifying the original source of funds - hence, Arizona is "dark money" friendly. (Arizona's Politics discussed the *anonymizing* process in light of California's settlement with two of Arizona political consultant Sean Noble's committees. The same operation had been involved with a large anonymized cash flow for the anti-education-sales-tax-extension effort led by State Treasurer Doug Ducey. When their first (substantive) finance reports are due to the Secretary of State on September 25, GC-CJF and RAGA will both likely show contributions only from their parent organizations. That makes their pre-election disclosures several shades darker. Their parent organizations do NOT have to disclose to the states or to the Federal Election Commission ("FEC"). They do, however, have to report to the Internal Revenue Service ("IRS") on a regular basis as Section 527 "Political Organizations". In these reports, they DO have to list the contributors, the amounts contributed, and basic expenditure information. They do NOT get to redact key information as politically-active social welfare organizations - such as the aforementioned Noble organizations - are able to do. This makes DAGA and RAGA several shades lighter than the social welfare organizations and other groups that have become known as "dark money". HOWEVER, in reviewing the IRS filings of DAGA/CJF and RAGA, it is apparent that - in addition to the many normal political contributions and the somewhat questionable ones of businesses or industries that may be hoping for kind treatment from state law enforcement agencies ("pay-not-to-prosecute"?) - the latter (RAGA) also has received a lot of seed money from actual dark money organizations. RAGA collected approximately $7.4M in the first two quarters of 2014, compared to approximately $2.3M for DAGA. Of those, #1-3 and #9 are completely dark money, totaling $2.25M of the $7.4M collected. The $360,000 from #4-5 also contain portions of dark money from the same or similar sources, and some of the smaller contributions may also be from dark money groups. So, somewhat greater than 30% of the total collected by RAGA has dark money origins. The closest to a significant dark money contribution to DAGA that we were able to locate was the $25,000 given by the AAJ PAC on Feb. 24. The AAJ ("American Association for Justice") PAC received a $1.5M loan - far and away the most significant part of its budget - in July from "The Private Bank & Trust"; it is unclear whether that is a arms-length loan by the bank or a soon-to-be-forgiven loan from a friend. As noted earlier - and it can not be emphasized enough - there are plenty of interesting questions that can be raised by other contributions (and expenditures) in these reports. You could easily make the argument that the risk of inappropriate prosecutorial decisions - and, the difficulty in discovering and/or proving them - is greater in the DAGA/RAGA realm than the risks and resulting difficulties posed by similar contributions in the Republican Governors Association/DGA, the DCCC/NRCC, or similar realms in the legislative and executive areas. However, this article intended to deal with the 50 shades of dark money in this corner of the campaign world. If we had time (or, the skills) for a cool graphic, we would do it. (Anyone? Anyone?) But, if money spent directly by a candidate is the least dark (0), and money spent after being filtered through several different businesses or organizations in an attempt to conceal the originators of the dollars is 50 shades of dark, money spent by committees that disclose before the election (to the Secretary of State or the FEC) falls somewhere in the middle. If those disclosures end up showing that significant sums are coming from entities that will not disclose (to the IRS) until well after the election, then you have to take your dark money pencil and shade them in a bit more. Even more if those secondary entities are non- or little-disclosing social welfare organizations/trade associations/corporations/etc. Yesterday, Arizona's Politics reported on the $1M ad buy by an arm of the Democratic Attorneys General Association. Today, word comes of the earlier launch of an ad campaign from the Arizona arm of DAGA's Republican counterpart. RAGA Arizona ("Republican Attorneys General Association Arizona") plunked down $360,000 for the first week of Phoenix airtime seeking to (negatively) define Democratic nominee Felecia Rotellini. Significantly, RAGA is now slated to hit the airwaves on October 6, while the DAGA ad (which indicates it mentions both GOP nominee Mark Brnovich and Rotellini) does not start until October 14. With early voting beginning on October 9, the GOP jump on defining the opponent could be significant. Rotellini's campaign told supporters in a fundraising email yesterday that $1.6M in attack ads against her were about to hit. The National Republican Congressional Committee ("NRCC") just released its newest ad against incumbent Rep. Ron Barber (D-CD2) today, going after him on the issue of border security for the first time. The ad features Chris Kemmerly - identified as a rancher - talking about securing the border. It cites a single vote in August on a supplemental appropriations bill that passed on a straight-line party vote (and has not been heard from again). The ad (titled "Rancher") cost $21,250 to produce, and the NRCC indicates that it is spending $186,778.45 to air it in the Tucson market during the next week. (Update, 11:50am: Goddard just Tweeted his "Happy to hear it" response, and tried to turn the attention to issues that he better knew her positions on: SB1062 and HB2305. Oops! Terry Goddard, the Democratic nominee for Secretary of State, thought he might score a few points on Twitter this morning off of a Howard Fischer news article talking about Republicans who might try to block registered independents from voting in future GOP primaries. Unfortunately, GOP nominee Michele Reagan immediately responded that she has always favored the open primary and added a zinger. Goddard, an attorney, violated one of the key rules of cross-examining a hostile witness, that also applies to campaigning: don't ask a question that you do not know how the witness will answer! The 2nd rule is you should do your research beforehand and know how the witness/opponent will answer. Goddard hoped to hang Reagan with a position that is sure to be unpopular with the voters who could make the difference in the Secretary of State's race. However, he should have checked her clearly-stated positions before engaging in deates (Twitter or otherwise). Here is Reagan answering questions for the Small Business Alliance - in a process that Goddard also participated in - on YouTube: "I really, really, really have been encouraging people to vote in primaries. I don't care what party you are, or if you're no party...."
Here's the link to the rest of the Small Business Alliance videos of Reagan (and other candidates) in case someone (hint, hint) wants to view them. While just about everyone's heard about former President Bill Clinton dropping into Scottsdale today to raise some cash for Democratic nominee for Governor Fred DuVal, there are a couple of other noteworthy fundraisers also going on back in the nation's capital. GOP Congressional challengers Martha McSally (CD2) and Wendy Rogers (CD9) are getting the all-star joint fundraising committee power from Rep. Cathy McMorris Rodgers, House Speaker John Boehner and others today. The mega-fundraiser by the RISE Project ("Republicans Inspiring Success and Empowerment") is expected to raise about $500,000 to be split among 10 female House candidates. And, in the heat of the very competitive GOP primary for Governor, an interesting fundraiser was quietly scheduled for today. Cold Stone Creamery, the company that GOP gubernatorial nominee Doug Ducey formerly owned, decided to hold a fundraiser for one of Arizona's U.S. Senators, Jeff Flake... for his 2018 re-election. Flake was widely believed to be in Ducey's camp, even allowing his name to be added as a host for a fundraiser early on; however, when it came time for endorsements, Flake and colleague John McCain decided not to publicly support one over the other five Republicans. Since we are discussing the new campaign by the Democratic Attorneys General Association to win Arizona's Attorney General's office for Felecia Rotellini - and, its coming-soon-to-every-screen-near-you $1M ad - it seems appropropriate to revisit the nasty attack ad the AG's group leveled at then Superintendent of Public Instruction Tom Horne. The ad, through attack ad arm Committee for Justice & Fairness, was aired non-stop during the last weeks of the campaign. The Democratic Attorneys General Association ("DAGA") is back. It spent heavily in Arizona in 2010, and has been paying the price ever since. Today, Arizona's Politics is reporting, DAGA is preparing a $1,000,000 ad buy, slightly changing the name of their now-infamous attack ad committee. Last week, DAGA's attack ad arm, the Committee for Justice and Fairness ("CJF"), appealed its 2010 case to the Arizona Supreme Court. Earlier this year, the Arizona Court of Appeals found that CJF had violated Arizona campaign laws by not registering as a political committee before unleashing a scathing ad against then-State Supt. of Public Instruction and GOP nominee for Attorney General Tom Horne. CJF has argued - is still arguing - that the law is unconstitutional, and that the ad was not campaign-related - it was simply urging Horne's Public Instruction constituents to call and express concerns. Now, CJF has formed the Grand Canyon Committee for Justice & Fairness ("GC-CJF"), and have worked out a $777,666.67 Phoenix market ad campaign to begin October 14 and ending Election Day morning (November 4). That heavy buy does not include Tucson, Flagstaff, Yuma and/or cable, and does not include the production costs. Arizona's Politics has covered the CJF/DAGA saga extensively in the past (here is the infamous ad), and will continue to keep a close eye on these new developments. In case it was not clear based upon the amount of attention being paid it from national groups, the Arizona Congressional District 1 contest is now rated as a "pure toss-up" by the Rothenberg Political Report. Rothenberg added the race between incumbent Rep. Ann Kirkpatrick (D-CD1) and GOP nominee and Arizona State House Speaker Andy Tobin to its list of eight toss-up House seats on Friday. Until now, Kirkpatrick had been placed in the "Toss-Up/Tilt Democrat" category. Rothenberg changed the ratings in nine House, Senate and Governor races around the country this weekend - eight of those changes moved in the Republicans' direction.